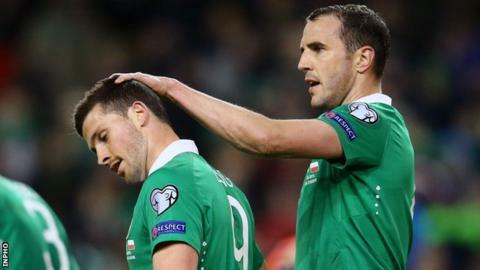 John O'Shea may miss both the Republic of Ireland's Euro 2016 play-off games with Bosnia-Herzegovina after suffering a recurrence of a hamstring injury. O'Shea, already suspended for Friday's first leg in Zenica, missed Sunderland's defeat by Southampton on Saturday. Now Sunderland boss Sam Allardyce does not expect O'Shea to be ready for the second leg on 16 November. "He's not going to get fit in 10 days with a hamstring injury," he said. "He will be talking to them - the Republic - but I wouldn't have thought that, with the recurrence in his hamstring, he would be anywhere near available. "He's not been able to get fit for us in two weeks. He got through training all right yesterday and was selected to play, but felt it this morning, so we took him out." O'Shea, who has 108 Republic caps, has not played since damaging his hamstring in the 3-0 derby victory over Newcastle on 25 October. Republic manager Martin O'Neill had named Sunderland defender O'Shea in a provisional 39-man squad for the play-off games, even though he is suspended for the first leg. The Republic are already without injured Hull City midfielder Stephen Quinn while Southampton striker Shane Long is a major fitness doubt because of an ankle injury. Long was not fit enough to play for Southampton in Saturday's win over Sunderland.